SANDOWN PARK has witnessed many dramatic moments in its time as one of England's premier race courses, writes Neil Cafferky. PITY THOSE poor hardworking, low-paid MPs! The independent auditor, Sir Thomas Legg, has been reporting on some of the expenses claims made by MPs on second houses, writes Kevin Parslow. OVER RECENT months meetings have taken place of the participants in the 'No2EU-Yes to Democracy' European election coalition to see whether another alliance could be constructed to contest the forthcoming general election. Informal discussions have also been held with some left trade union leaders not involved in No2EU. Leeds bins - 9th week: The LibDem joint leader of Leeds city council, Richard Brett, further insulted striking refuse workers last week by saying you don't need a degree to be a rubbish collector, writes Alistair Tice. Workers in the unions Unite and the GPMU stopped production at Crown Aerosols UK in Sutton in Nottinghamshire on 19 October, writes Socialist Party reporters. This dispute and the reasons for these strikes go all the way back to 2002 and the appointment of Allan Leighton and Adam Crozier as chairman and chief executive of Royal Mail, a Coventry postal worker writes. Want to change the world? Join the Socialist Party! No one today can doubt that capitalism is a system in crisis. 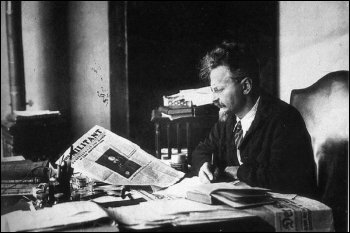 The capitalist propaganda of the previous decades lies in tatters, writes Hannah Sell, Socialist Party deputy general secretary. Sick and disabled under attack: THE PRO-big business parties, New Labour, Tories and LibDems, vied with each other at their party conferences with zealous plans to make the working class pay for the economic and financial crisis, writes Jim Horton, welfare rights adviser, north London. 1,000,000 young unemployed: It is hard to imagine what was going through the heads of the producers of ITV's Tonight show when they decided the best person to 'advise' unemployed youth on how to improve their job prospects was... Lord Alan Sugar! 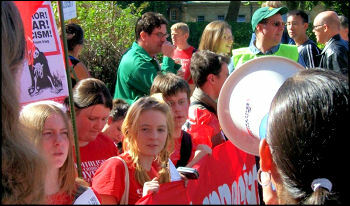 Sean Figg, Youth Fight for Jobs national organiser, writes. The RMT transport union hosted an open-to-all conference on the crisis in working class political representation on Saturday 7 November. This followed the overwhelming backing given at the RMT's annual general meeting in July to the union's participation in the 'No2EU, Yes to Democracy' European election coalition, and a decision at that meeting to continue the discussion on the lack of working class political representation. 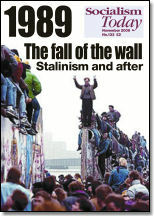 Socialism 2009 - an excellent weekend! 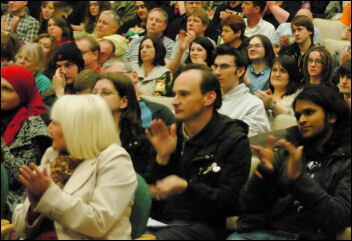 A thousand people came to Socialism 2009 over the weekend to participate in the various discussions and to be inspired by the two rallies. From long-standing Socialist Party activists to those attending their first ever meeting, everyone got something out of it. "This event allowed me to really understand what the Socialist Party is actually about," said Jessica from Peckham in south London. "I joined the Socialist Party at the event." 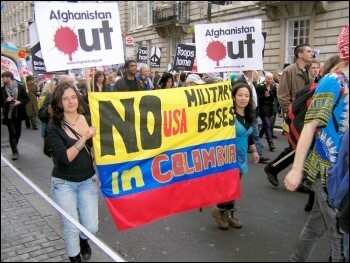 End the war in Afghanistan: Bring the troops back now! THE WORLD'S leading politicians, past and present, gathered in Berlin this week to celebrate the fall of the Berlin Wall in November 1989, writes Dave Carr. The United Socialist Party (USP), the Sri Lankan section of the Committee for a Workers' International, held its eleventh national congress from 31 October to 1 November 2009 in Colombo, writes Siritunga Jayasuriya, secretary, United Socialist Party. Despite completely made-up media reports of 100 strikers returning to work, resolve amongst Leeds refuse and street cleaning workers remains high going into the tenth week of all-out strike action, writes Alistair Tice. Six days of strike action by 700 South Yorkshire Fire Brigade Union (FBU) members have forced major concessions from the Chief Fire Officer and Labour-controlled fire authority, writes Alistair Tice. At the end of November Corus steelworkers will harvest the fruits of victory when they receive two bonus payments in one pay packet, writes By a steelworker. UCU members at Barnsley college are fighting pay cuts and increased workload. 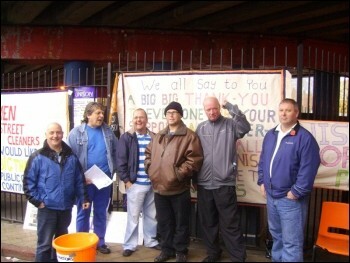 Strike action took place on 3 and 5 November, writes Kirsty Morris Welsh. Austria: United action: The last months of raging capitalist crisis have seen devastating attacks begin on the living standards of workers and youth around the world, writes Laura Rafetseder, Socialist Left Party (SLP, CWI in Austria). Four Socialist Party members - Onay Kasab, Glenn Kelly, Brian Debus and Suzanne Muna - are facing bans from holding office in Unison, ranging from three to five years. This was as a result of a leaflet distributed at Unison conference over two years ago! Review: John Reid's eighth edition of Reclaim the Game updates and develops his critique of the "greed is good" culture of British football, writes Jared Wood. Demonstrate 28 November: New Labour and the Conservatives are determined to make young people and workers pay for this crisis, writes Ben Robinson, Youth Fight for Jobs (YFJ) campaign national chair. Anti-fascists tactics - What happened in Newport? Assemble 12 noon, Malet Street, London WC1E 7HY, nearest tube Euston or Russell Square. TAMIL-SPEAKING refugees remain on a boat in the Indonesian harbour of Merak, denied their fundamental human rights, writes Senan, Tamil Solidarity. LABOUR'S VICTORY in the Glasgow North East by-election last week by more than 8,000 votes over the Scottish National Party (SNP) seems, on the face of it, to be a surprise, writes Philip Stott, International Socialists (CWI Scotland). 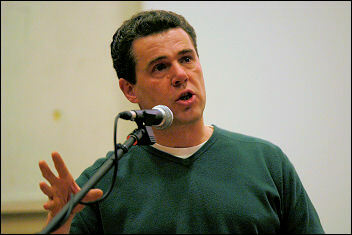 Mark Serwotka, the general secretary of the Public and Commercial Services union (PCS) is standing for re-election in the next few weeks. 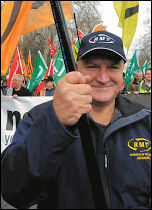 Mark spoke to The Socialist about the challenges facing the union and its members. "Don't mess with the best!" Is what one worker quipped to sellers of The Socialist the morning that the Brighton bin workers returned to work after less than two days of solid strike action, writes Sean Figg. Now into week 11, the bin strike in Leeds has been the most significant piece of industrial action in Yorkshire since the miners' strike, writes A Leeds Unison steward. Superdrug workers at the company's distribution centre in South Elmsall, West Yorkshire, were in defiant mood as their strike entered its third week, writes Steve Faulkner, South Elmsall. The dispute between 700 bus drivers, members of Unite, and First Bus in Sheffield has been in force for a few months, writes An Olive Grove depot bus driver. Steve Bell of Aylesbury Socialist Party recently interviewed a car worker at the BMW plant in Oxford, writes What is your working life like at the moment?. At the instigation of the London Shop Stewards Network, an important meeting took place on 16 November, writes Greg Maughan. Scourge of mass youth unemployment: Youth unemployment is at a record high and what does the government do? It plans to slash funding for youth training schemes. What do the bosses do? They cut jobs, pay and conditions. 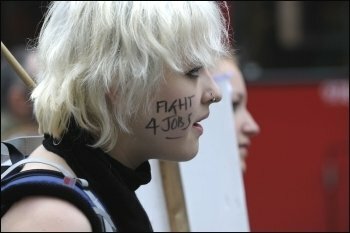 1 million unemployed young people: Demonstrate this saturday! 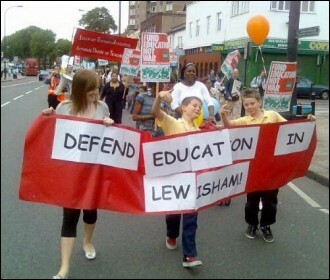 Youth Fight for Jobs - for real jobs Assemble 12 noon, Malet Street, central london, WC1E. Nearest tube Euston / Russell Square. How could full youth employment be achieved? Lessons of struggle: If you fight, you can win! 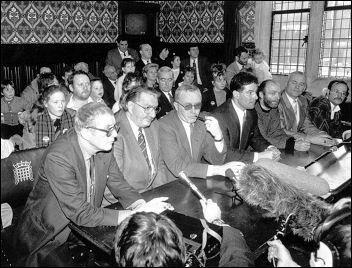 Liverpool Council 1983 - 1987: Young people face enormous attacks on their right to a future - unemployment, low pay, ever-increasing university fees and slashed public services. Here, Socialist Party activists provide a small taste of some of the past battles they have been involved in where victories were won by working and young people. 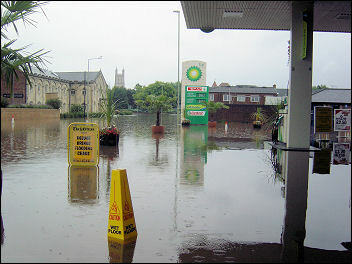 ONLY FOUR years after devastating floods forced thousands from their homes across the county, the heaviest rainfall on record brought rivers crashing over their banks and through people's homes, writes A Cumbrian resident. Main parties plan cutbacks: It's time for a fightback! THE CORONATION of Afghanistan's president Hamid Karzai offers no solution to the long suffering workers and poor peasants of Afghanistan, writes Nick Chaffey. 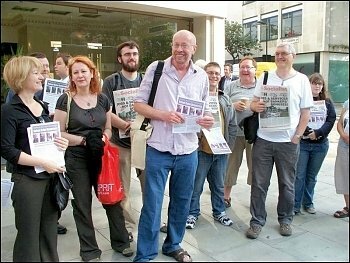 Lewisham National Union of Teachers (NUT) secretary and Socialist Party member Martin Powell-Davies received over three thousand first preference votes in the election for NUT vice-president, coming fourth out of six candidates, writes Report from Socialist Party Teachers. As the axe of council cuts looms and falls, with public services paying the price for the recession, school support staff are directly in the firing line, writes An education worker, Huddersfield. As the bin strike in Leeds entered its twelfth week, an agreement was reached between refuse collectors and Streetscene workers, and the council, writes A Leeds Unison steward. News of 127 job losses among support staff has been met with outrage by the staff and their trade unions at Manchester Metropolitan University (MMU), writes Hugh Caffrey and Socialist Party supporters at MMU. On Tuesday 17 November a delegation from the Bristol Youth Fight for Jobs (YFJ) campaign met with the Liberal Democrat leader of Bristol city council, councillor Barbara Janke, to discuss the council's response to the present crisis of youth unemployment, writes Andrew Taggart, Bristol YFJ. The London divisional committee of the postal workers' union, CWU, have unanimously voted to call on the CWU's national postal executive to reinstate the national strike, writes Bill Mullins. In driving rain, hundreds of bus drivers formed picket lines across East London on 20 and 21 November, writes Paula Mitchell. Stoke: After four 24-hour strikes at Axiom in Stoke, the workforce, Unite members, has become even more determined to win this dispute for a decent pay increase, writes Andy Bentley, Stoke Socialist Party. TAMIL SOLIDARITY, an international campaigning network, is building up its forces in Greater Manchester against the Sri Lankan government's repression of Tamil speaking people, writes Lawrence Arokianathan, Tamil Solidarity, Manchester. People's Charter - a step towards workers' political representation? Workers from the Superdrug distribution centre in South Elmsall, West Yorkshire voted to go back to work this week after almost four weeks of strike action, writes Steve Faulkner, South Elmsall. Racists - stay out of Wrexham! ON SATURDAY 21 November, the racist English Defence League, masquerading as the Welsh Defence League, held a demonstration outside a pub in Wrexham town centre, writes Dylan Roberts, Wrexham. It comprised of 30 football hooligans from Bolton and a mere half a dozen local racists who chanted slogans such as "kill the Muslims".